Near The Russian Border, U.S. And NATO Beef Up Their Presence : Parallels U.S. troops are training in Estonia, just 70 miles from the Russian border. It points to NATO's increased activity in the Baltic states and Poland amid the growing tensions with Moscow. An Estonian soldier takes aim during a training exercise at Tapa Army Base, Estonia, on Nov. 17. 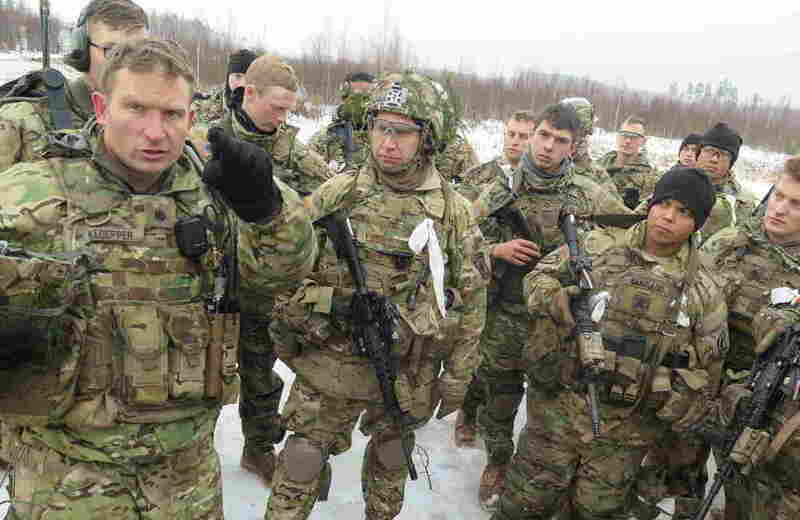 U.S. troops were also taking part in the training, about 70 miles from the border with Russia. NATO countries are stepping up their presence in Eastern Europe at a time of rising tensions with Russia. 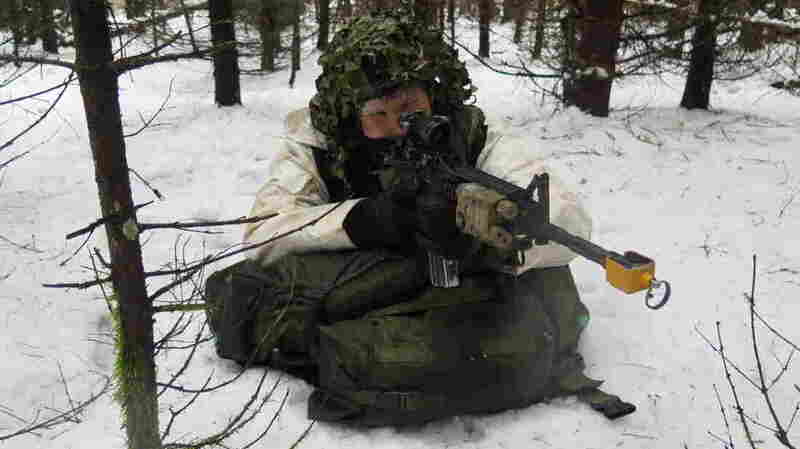 Rifle fire crackled over a snowy field in central Estonia, interrupted by the rhythmic thumping of a heavy machine gun. From their position on a ridge, paratroopers from the U.S. Army's 173rd Airborne Brigade opened up on the opposite tree line, as their comrades below inched toward an imaginary enemy bunker. The foe in the exercise earlier this month was unnamed. But with the Russian border just 70 miles away, it was clear what kind of scenario was being played out. "What you're seeing today is not special or unique necessarily in terms of frequency," said U.S. Lt. Col. Mike Kloepper, the battalion commander. "We're doing something like this here every week." Since 2014, when Russia annexed Crimea and began supporting an armed insurrection in Ukraine, the United States has been leading a military buildup in Eastern Europe to ensure the same won't happen to NATO's newest allies. But since the election of Donald Trump, many in this region are worried that the incoming president is less committed to the alliance and more concerned about mending relations with Russia. During the election campaign, Trump questioned NATO's treaty obligation that says an attack on one of the 28 member states is an attack on all. He also expressed admiration for Russian President Vladimir Putin and suggested a Trump administration would consider recognizing the annexation of Crimea and lifting sanctions on Russia. One of Trump's first big foreign policy tests might come early next year, when NATO begins stationing battalions in the Baltic region. According to a NATO decision taken in July, Britain will lead the NATO battalion in Estonia, while the United States will head up the one in Poland. Putin has repeatedly expressed disapproval of the plan and will likely raise it with Trump. "What is expected is that the new president will confirm the commitments that the U.S. has, through NATO, in our region," said Kristi Raik, a senior fellow at the Finnish Institute of International Affairs in Helsinki. "One clear example is whether the agreement that has been made on an increased NATO presence in the Baltic states will be maintained and actually implemented," she added. U.S. Army Lt. Col. Mike Kloepper (left), talks with soldiers from the 173rd Airborne Brigade after a live-fire exercise near Tapa, Estonia. The fear of Russia is real. The Soviet Union seized the Baltic states — Latvia, Estonia and Lithuania — during World War II, even though the United States never recognized their annexation. When the Baltic countries regained independence after the Soviet collapse in 1991, they regarded NATO membership as the best guarantee of their security. The tiny countries lack the wherewithal to confront Russia on their own. "It's important to understand that the U.S. troops — and soon the coming British battalion — are not here for Estonia's defense," said Hannes Hanso, who served as Estonia's defense minister until last week. "From here we defend Copenhagen, Paris, London and Washington — because this is where the tensions are right now because of our eastern neighbor, Russia." Leading up to the planned NATO deployment to the region, U.S. Army units have been rotating through Eastern Europe. Soldiers joke that "the 173rd Airborne is Russian for 'speed bump.' "
At Estonia's Tapa army base, troops from the 173rd Airborne are housed with a platoon from Slovenia's 10th Infantry Regiment. Slovenia, like Estonia, was a newly independent country that joined NATO in 2004. "Before we came up, everybody was looking at Google Earth to check where Estonia is," said 1st Lt. Janez Cuznar, the Slovenian liaison officer. Construction is in full swing in Tapa to build the barracks for the British troops due here next year. Earth-movers scrape the frozen ground to lay the foundations for gray, three-story blocks. For Estonia, the United States and Britain are its most important allies. But after Britain's referendum last summer to exit the European Union, and now the U.S. presidential election, Estonians are concerned they will be left to fend for themselves. Jüri Luik, a former Estonian foreign minister, notes the isolationist tendencies in America before each of the two world wars. "This is about peace, this is not about war. In fact, weakness can lead to war," said Luik. "For the U.S. to leave Europe will not make the U.S. more secure. It will make the U.S. less secure." Estonians and other Eastern Europeans are hoping their message will get through to Trump before he takes office.